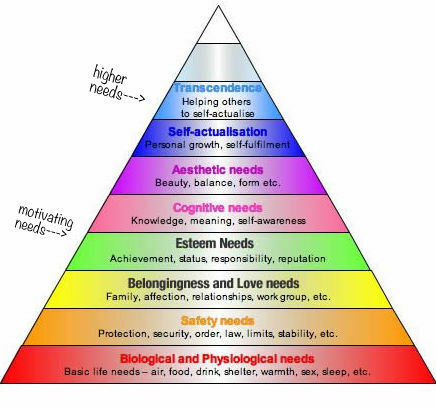 Welcome to Abraham Maslow‘s expanded Hierarchy of Needs Pyramid. 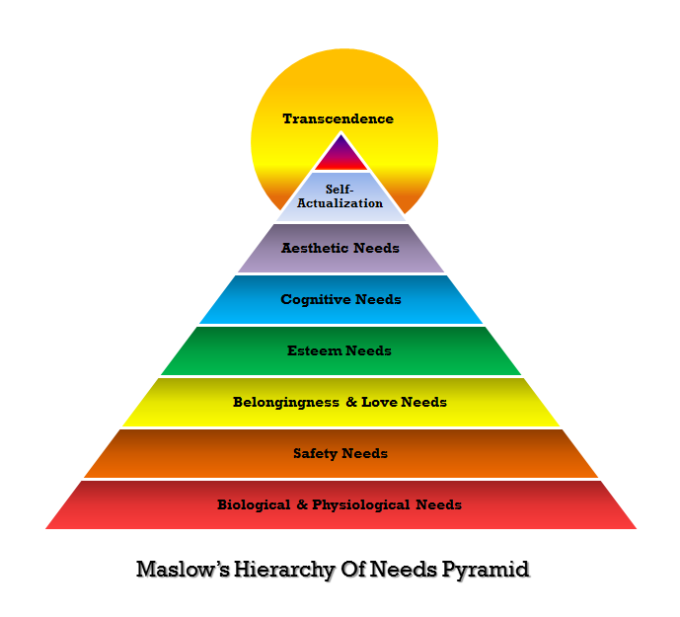 Maslow, a psychologist and professor, created this pyramid after years of study of mentally healthy subjects. His goal was to better understand what self-help gurus have co-opted as “peak states” of life and the structure of needs that must be met for someone to fulfill their potential. And, of course, once you can see what is out of whack, you can absolutely get on track! How can you use this little pyramid as a guide to focusing your energy to create a more balanced, creative existence? Belongingness: Family, Intimacy, Relationships, Friendships… How are you doing? If you have not yet met your soulmate, this isn’t the end of the world, however if you feel lonely, isolated, introverted or socially off-kilter, this is a big area to explore. Before we go any further, take a quick look at how you feel about each of these areas of your life. If you feel like you are not that solid in one area on the pyramid, examine how strong you are in the area beneath it. For example, if you are having a hard time getting a job (Security), how well are you eating, sleeping and thinking these days (Physiological)? If you look at the level below you get clues as to how to approach the problem or need that you are motivated to resolve. Another example: If you have a poor sense of self worth and constantly feel broken or sub-par (Esteem), look to your relationships and see how engaged you are in them and how healthy they are (Belongingless). A bad egg of a friend can make you feel terrible about yourself, just as a bad relationship with a parent can leave you feeling worthless even if you are doing great things in life. Working on bettering those relationships, accepting, changing or understanding of them can help you build greater Esteem. Is this making sense?! I hope so! The “Higher Needs” (the Cognitive need to understand things, the Aesthetic need for creativity and beauty, the need to Self-Actualize or live up to your potential and, finally, the need to hit Transcendence and help others to become actualized) are the ones we might not meet as often if we get caught up in bad habits and a struggle for survival at the bottom of the pyramid. I wanted to share this with you as it can be an exciting tool to re-focus your energy in the pursuit of your dream life! Again, the pyramid was not created to judge you, nor was it meant to be a one-size-fits-all equation. That said, more often than not, if you are melting down in any area of the pyramid you might have a hard time developing solid progress above it. Does this mean you won’t be able to make art if you have a terrible relationship with your parents? Nope. It does mean that unless you reconcile those emotions with your family in some way (and it doesn’t need to be airy fairy, but just confronted) this emotional instability may affect your ability to feel good enough about yourself to actually make art or feel good about it and yourself even if you are productive! So, the pyramid gives you a hint as to where you might want to focus and smooth out the anxieties and tensions. Many times I see people struggling to fulfill the the top needs of the pyramid (” I want to be transformed !”) before they have the bottom needs (“I hate my job.”) met. That’s the joy and irony of our modern society. This little pyramid tool can help you to get focused on the basics & the basics are where it’s at if you’re looking for happiness and stability, and, ultimately, self-actuaization! The Single, Ultimate Goal For All Mankind…! A Fool Proof Set Of Steps To Bring Anything You Dream About To Life! Sooo well explained! Must share! So glad I get to read your blog posts. Awesome! I think It’s really helpful to identify the problematic are in a quick in grafic way. Awesome! I disagree about putting Aesthetics needs above Cognitive needs. Hi! I’m not quite sure what you mean. Can you explain? 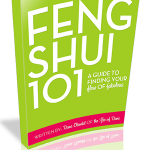 Next post: Feng Shui 101: Little Tweaks Can Make Gorgeous Interior Design Totally Brilliant!